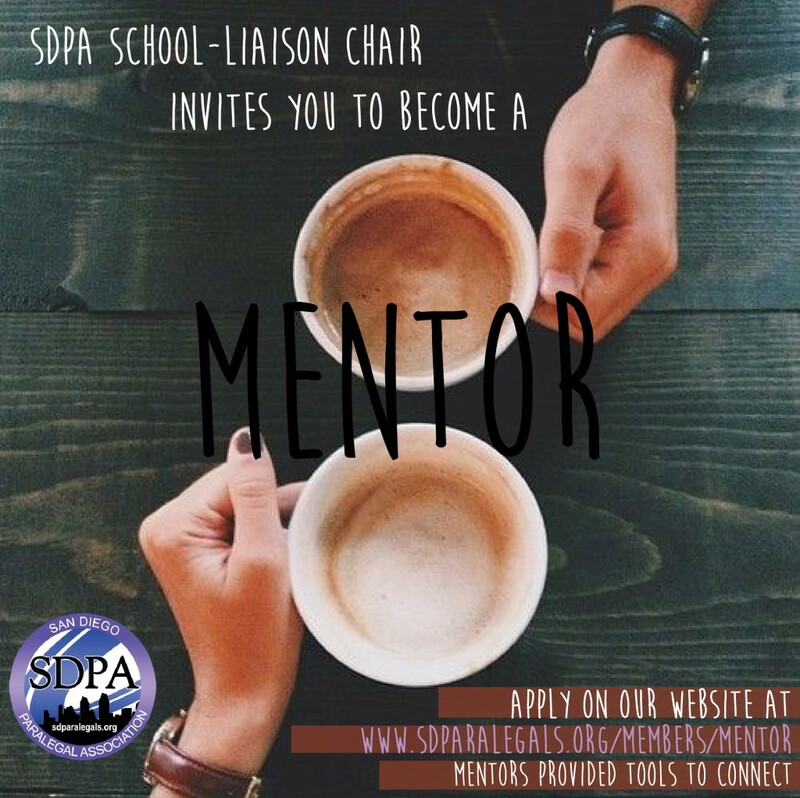 The San Diego Paralegal Association’s (SDPA) School Liaison committee invites you to participate in the Mentoring Program. SDPA seeks to pair paralegal mentors with paralegal mentees to facilitate a support network and a long term relationship to aid in building careers. Mentors are to provide support, guidance and direction to students and to discuss with their assigned mentee questions relating to the paralegal profession. It is also expected from mentors to address ethical issues, job market questions, office politics, education opportunities, and career development. Mentors must make themselves available to their mentee at least once per month in order to facilitate this relationship. Both mentors and mentees must be SDPA members in order to be eligible to participate in the program. SDPA seeks to encourage a long term relationship to develop between mentors and mentees, but a minimum of one year participation will be mandated through the program. The mentorship program will offer guidance and support to mentors to facilitate regular meetings with their mentors. SDPA will host quarterly mixers for program participants as well as provide quarterly check-ins with mentees to ensure they receive the support they need. Please fill out the appropriate application below and email them to mentorship@sdparalegals.org and the Mentorship Committee Chairs will be in contact with you shortly. There are no requirements for the type of paralegal who can become a mentor, only a willingness to aid in the development of another more junior paralegal.